MIDI Solutions Inc. is a leading manufacturer of MIDI processing products, dedicated to creating innovative and affordable MIDI products for a wide range of MIDI applications. MIDI Solutions has experienced steady growth since it was founded in 1992, and has provided solutions to countless musicians, engineers, and industry professionals throughout the world. The Quadra Thru is a 1-in 4-out MIDI Thru Box. All MIDI messages appearing at the input are sent to all four Thru outputs. Active circuitry cleans up any skewing of MIDI data bits that has occurred at the input, ensuring reliable operation in setups that require daisy chaining or long cable runs. 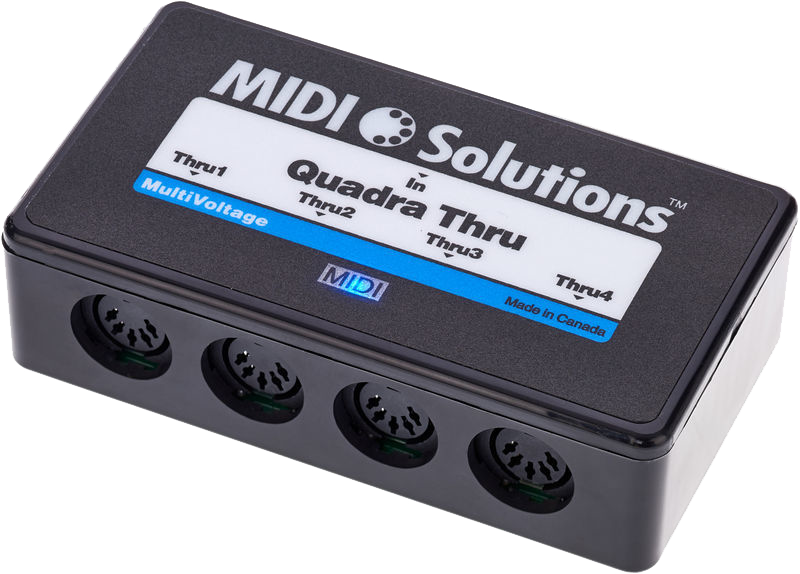 The Quadra Thru is MIDI-powered, and requires no batteries or power supply to operate with most MIDI products (providing they send MIDI power). A MIDI indicator LED lights up when the product is powered and flashes when MIDI data passes through it. The Merger is a 2-in 1-out MIDI Merger. All MIDI messages appearing at the two inputs are merged to the output (including System Exclusive, MIDI Clock, and MIDI Time Code messages). A fast merging algorithm ensures that all MIDI data is processed accurately with the minimal possible delay. 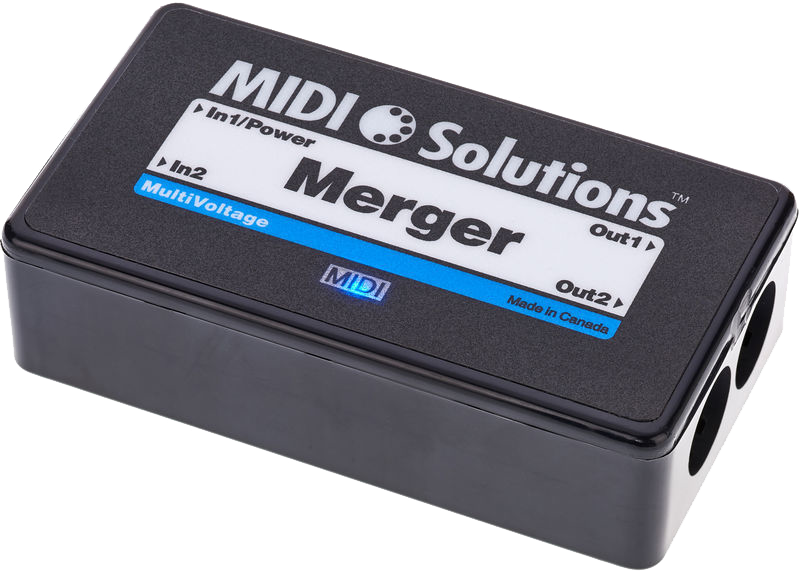 The Merger is MIDI-powered, and requires no batteries or power supply to operate with most MIDI products (providing they send MIDI power). A MIDI indicator LED lights up when the product is powered and flashes when MIDI data passes through it. The R8 8-output MIDI-controlled Relay Array contains eight relays which can be programmed to open or close in response to MIDI events. Event types are programmable and include Note, Control Change, Program Change, and System Exclusive. Fast reed relays are used for a response time of less than 2ms. Relay contacts are rated at 500mA. Contacts are made available via connections at the tip and sleeve of 1/4" mono phone jacks. When switching inductive loads be aware of precautions that must be taken to avoid back EMF problems. The R8 is programmed by sending it MIDI System Exclusive messages. This is easily done with the MIDI Solutions Programming Tools software. Once programmed, the R8's settings are retained even after power down. The R8 can be reprogrammed with new settings as often as needed. The R8 is MIDI-powered, and requires no batteries or power supply to operate with most MIDI products (provided they send MIDI power). A MIDI indicator LED lights up when the product is powered and flashes when MIDI data passes through it.